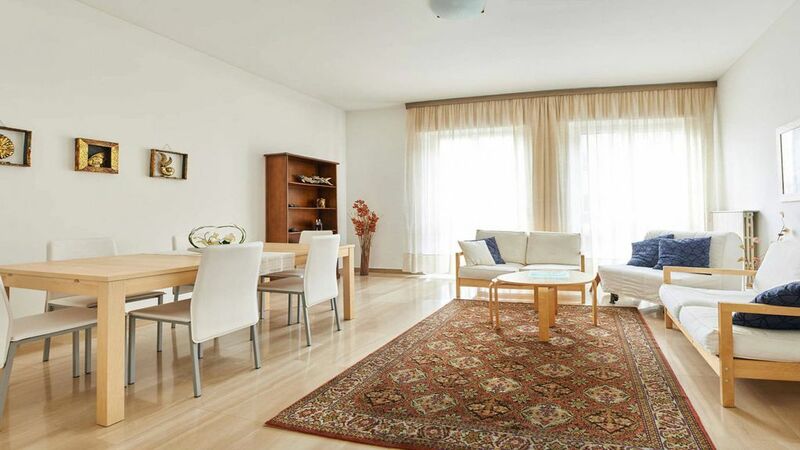 "Bergamo Charming House", cozy and spacious apartment in the heart of the lower city in a strategic position to reach on foot the main points of interest, visit the city and use public transport. At 50 meters from the stop for connections to and from the airport and about 200 meters from the railway stations and bus lines. Ideally located also for business stays. Furnished with care, it has two bedrooms (one double with possibility of extra bed / cot and one with two beds), large dining room with sofa bed (2 singles), living room with balcony overlooking the upper city. The kitchen with balcony, equipped for every need, also has a microwave. It is equipped with two bathrooms, one of which has a shower and a washing machine. Bath towels and bed provided. This is a very nice and spacious unit very close to downtown. It doesn't have a great view of the old town, but you can see it from either of the two(!) balconies. The apartment is ideally located for exploring Bergsmo and the surrounding area. Right in the centre of the town but very quiet. We felt perfectly safe in the area . The apartment was exceptionally clean, well equipped and very spacious. It was reassuring to know Claudia, the owner, lived close by as we knew if we had any issues she would be on hand to deal with them. Thanks Dianne ! you'll be welcome back anytime !